Thank you Allan!! Posted on the featured image discussion! 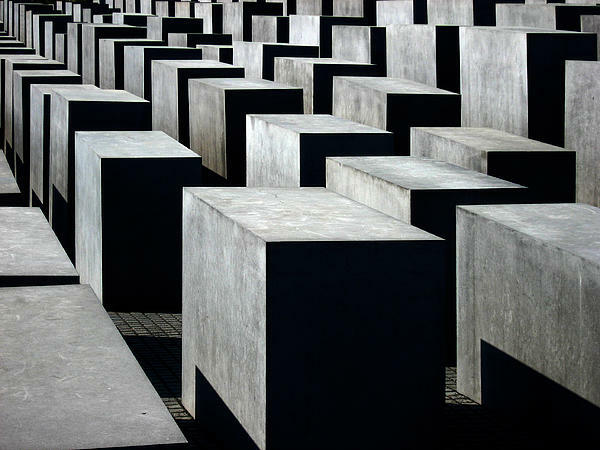 Thank you to the buyer from Leawood, KS - United States, for purchase a 24.000" x 18.000" print of my picture 'Memorial To The Murdered Jews Of Europe'!! A most important time in history to be remembered. Well done, Richard. Thanks for posting. Fav! Fantastic geometric pattern and contrasting tones. Great shot! 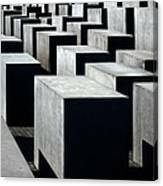 Monument for the jewish holocaust. Berlin, Germany. 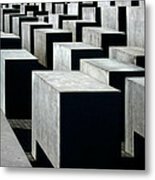 The Memorial to the Murdered Jews of Europe (German: Denkmal fur die ermordeten Juden Europas), also known as the Holocaust Memorial (German: Holocaust-Mahnmal), is a memorial in Berlin to the Jewish victims of the Holocaust, designed by architect Peter Eisenman and engineer Buro Happold. 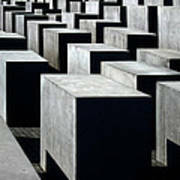 It consists of a 19,000 square metres (4.7 acres) site covered with 2,711 concrete slabs or "stelae", arranged in a grid pattern on a sloping field. The stelae are 2.38 m (7 ft 10 in) long, 0.95 m (3 ft 1 in) wide and vary in height from 0.2 to 4.8 m (8 in to 15 ft 9 in). According to Eisenman's project text, the stelae are designed to produce an uneasy, confusing atmosphere, and the whole sculpture aims to represent a supposedly ordered system that has lost touch with human reason.